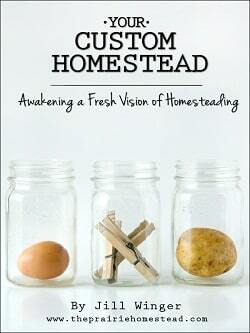 Looking for a homesteading how-to that's practical, inspirational and real? If you’ve been thinking about homesteading and weren’t sure how to get started, Jill Winger has put together a great resource in Your Custom Homestead to give you the “nudge” you need to get motivated. Jill's created a 21 day, step-by-step process to walk you through the planning stages of turning your home – wherever you live – into a homestead. I’ve been at this for years, and I still found her organization tips to be helpful. The personal stories are a lovely touch. If you purchase Your Custom Homestead through the link below, I receive an affiliate payment. (Thank you!) The book can also be purchased directly form Jill's site or for Kindle on Amazon.com. The last entry, Subscribe to the Prairie Homestead, won’t register. I did subscribe in my Google Reader, but can’t seem to make the entry work. I checked the setup on rafflecopter and as far as I can tell I’ve got it set up right. As anyone else running into this problem? Sorry for the technical difficulties! Vicki – I think pinterest may have a problem with pinning some giveaways. I just tried it and it doesn’t display right, either. Thanks to Laurie for putting the link right in my face so that I could find it! lol! You are a peach, Laurie! Pick me, ok?! I came over from the Prairie Homestead on FB. Happy to have an opportunity to win this. The discount is a great deal too! Shirley – any chance it could have been caught by your spam filter? I’ll contact Jill and see if she can track what happened. i know you’re going to enjoy it! Laurie ~ I found it! Thank you so much! And, yes! I will enjoy it! We plan to read it aloud…my husband is blind. We are so looking forward to it! I just scanned it briefly, and it LOOKS GOOD! I do need to “be content in whatever state I am in”! That may very well be the best lesson in the book. 🙂 So glad you found it. It’s not letting me enter. I’ve reloaded the page and tried different browsers and all the entry things are grayed out but I have 0 entries 🙁 still have 6 minutes. This giveaway is open now and ends Sunday, April 1, 2012 at midnight.